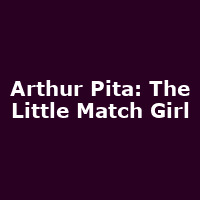 "Celebrated choreographer Arthur Pita brings his magical dance theatre show The Little Match Girl to the Lilian Baylis Studio this Christmas. Based on Hans Christian Andersen's classic story, this touching tale of a young street girl's hopes and dreams is beautifully told through dance, song and original live music. A snowy stage sets the scene for an icy cold Christmas eve, where the little match girl paces the emptying streets, trying to sell her matches. Cold, hungry and with just one final match flame to keep her warm, she sees a vision of her beloved grandmother. Leaving her troubled life behind, she is guided up into the night sky by her grandmother who takes her to the moon. Now, on a clear night, if you look closely, you might see the light of a shooting star, or is it a match burning brightly?"